Your Canon EOS 80D gives you pro-level photo power. All you need is some know-how about your camera's capabilities and a little experience to start capturing brag-worthy photos—and the expert tips and tricks inside get you there in a flash. 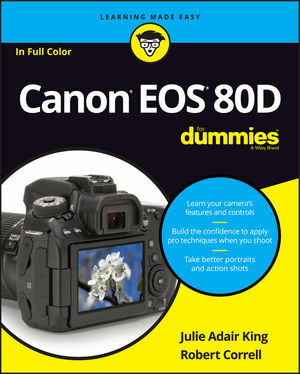 Essentially a photography class in a book, Canon EOS 80D For Dummies offers plain-English explanations of your camera's settings, how to shoot in auto mode, ways to get creative with exposure settings, ideas for getting artistic, and so much more. Complemented with inspiring full-color examples and simple photo 'recipes' for getting better portraits and close-up images, this hands-on guide covers the gamut of how to use your Canon EOS 80D like the pros. In no time, you'll get up to speed on making sense of your camera's menus and functions, capturing first shots in auto mode, adjusting exposure settings, taking control of focus and color, shooting action shots, sharing your photos, and everything else in between. Written with hobbyists and inexperienced photographers in mind, this no-nonsense guide shows you how to capture must-have images you'll be proud to add to your personal or professional portfolio. Julie Adair King is a veteran digital photography educator. Her best selling books include Digital Photography For Dummies and thirty titles on Canon and Nikon cameras. Robert Correll is a digital media expert who authored Digital SLR Photography All-in-One For Dummies.